Texada Island rises up out of The Straits of Georgia some forty miles west of Vancouver between Vancouver Island and the mainland. No doubt that the first to discover the Island were First Nations people evident by the fact that several middens and fish weirs have been found on the west shore of the Island. Arrowheads, spear heads and honed pieces of slate also have been found. The Sliammon First Nations Peopleâ��s name for Texada Island is Siâ�� yi yen. Visit the blacksmith shop and assay office. Find out how a â��Wee McGregorâ�� drag saw operates. View Don Pillatâ��s impressive collection of chainsaws. Discover how minersâ�� lamps have evolved through the years. 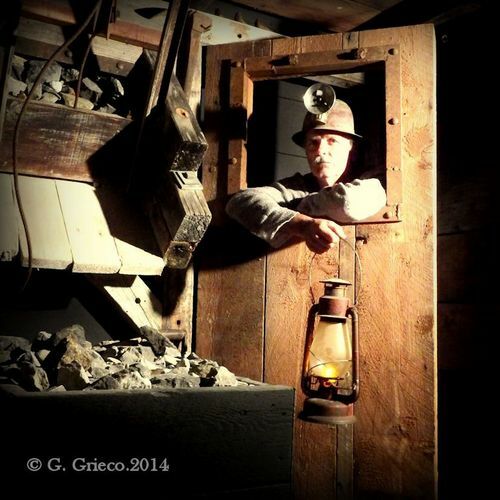 Imagine a trip down Little Billy mine with authentic ore cart and mine chute display. But mostly, our museum shines a light on the people and events of Texadaâ��s history. Through intricate woven cedar basketry and stone anchors our First Nations legacy is revealed. Both rough clay pots and delicate bottles speak of Texadaâ��s Chinese pioneers. used by Ideal quarry to warn of blasting. Bill Young lived on Texada for over 94 years. His hand-crafted herring rake conjures up images of a solitary fisherman paddling a dugout canoe. The fine desk from Dr. MacCallumâ��s office will rekindle memories for many museum visitors as will Kempeâ��s Van Anda Store glass display case. As we peer in many will recall pressing small noses against the same glass in years past to discover the magic of penny candy. Cookstoves, butter churns, treadle sewing machines and laundry washboards remind us that homemaking 100 years ago was, indeed, a chore (although Nan Johnsonâ��s red dancing dress speaks of lighter times). The Texada sports trophy collection reminds us of an active community. Your Texada Museum proudly collects, protects and displays treasures of our past and honours our pioneers, helping us to understand who we are today. The Van Anda Museum / Archives is open on a relaxed basis, between 10:00am and 12:00 pm on Wednesdays. It is also open July and August, Thursdays through Sundays from 11:00 am to 3:00 pm. Open on Long weekends and for special occasions by request. Open by request through out the year.